Electoral College Tie? What are Stock Market Volatility and Junk Bonds Telling Us? Likewise per CNN, Hillary Clinton has fallen below the necessary 270 electoral votes, uncertainty has implied equity market volatility near record levels when compared to actual, realized volatility. Hedge funds and asset managers globally are paying UP for protection. Pick up our full report, trading ideas here. This week, the S&P 500’s implied volatility crossed its long term moving average of 20, historically this type of price action occurs prior to large equity market sell offs. In a Trump induced flight to quality, U.S. treasuries were handed $2.5B of inflows this week, the highest since the July Brexit “risk-off” run to bonds. In high yield, CCC paper (the junk of junk bonds) yields 12.7%, that’s 495bps wider than their post-financial crisis tights. In other words, stocks are within 4.9% of their all time highs, high yield bonds aren’t even on the same planet relative to their best levels. Speaks to surging default risk in this late part of the credit cycle. We have a model which measures high yield bond’s performance vs. stocks, a solid “risk-off” leading indicator. U.S. HY corporate spread index were quoted 533bps OAS on Friday, +48bps since Oct. 27, the sell off in junk bonds has been for more profound than in stocks. Uncertainty over implementation of Trump rhetoric into policies will fuel a “risk off” bias among global investors. There will be a short-term flight to quality in corporate credit (bonds), companies will find it more expensive to borrow. This will lead to re-evaluation of risk tolerance worldwide and capital outflows. One of our classic “risk-off” indicators is making some noise here. Above you can see Junk bonds have been dramatically under-performing Investment Grade paper over the last two weeks. We’re seeing much higher yields on junk vs IG bonds. High-yield bond sales in the U.S. plunged 21% in 2016 when compared with the same period in 2015 as the number of transactions declined. Companies sold $220B of junk bonds this year through late last week, compared with $274B a year ago at this time. The number of deals decreased 16%. Election political risk, lower oil prices and a Fed trying to get off zero are all behind the move. Where’s the trade? Join us here. This is truly an incredible divergence. In all our years, we’ve very rarely seen the cost of equity market downside protection rise so much relative to such a small decline in the stock market. Since highs on October 28th, the S&P 500 is off only 2.6%, while the VIX is nearly 60% higher, from our Bloomberg terminal. A Rare VIX over VXV Cross, What Does it Mean? The VIX, or the CBOE Volatility Index shows us an estimate from market participants of where they think future volatility is heading. The index uses a weighted average of implied volatilities over a wide range of time periods. Simply put, its the average cost of downside stock market protection. Complacency found in the S&P 500 term structure just a few weeks ago has disappeared. Since the FBI reopened a probe into Hillary Clinton’s emails, volatility has exploded. The VXV/VIX spread has hit the lowest level since the Brexit referendum. The CBOE S&P 500 3-Month Volatility Index (VXV) is designed to be a constant measure of 3-month implied volatility of the S&P 500. One of our 21 Lehman Risk Indicators is found in opportunities around monitoring this spread, it tells us a lot, especially what to do. It’s Not A National Vote, Folks: An Electoral College Tie? This weekend, Trump plans to head to Minnesota in the final days of the campaign. Trump was already scheduled to hunt for votes in Nevada and Colorado later Saturday, states that have been leaning in Clinton’s direction for weeks but may be tightening as Trump sees his chances rise in national polls. He’ll also campaign in Pennsylvania and Michigan, per ACG Analytics. Minnesota hasn’t cast its electoral votes for a Republican since 1972. A Republican hasn’t won Michigan or Pennsylvania since 1988. Only 125.9m votes were cast in 2012, compared to nearly 131m in 2008. When watching early vote data come in, we MUST realize how small the GOP segment of the vote was in 2012. Improvements from 2012 in terms of turnout are key market metrics to watch, we’re keeping an eye on anything that will surprise markets. What’s the Risk of an Electoral College Tie? As our partner ACG Analytics has stated throughout this election cycle, there are various moments when one Presidential candidate will surge in the polls relative to another (during his or her party’s convention or in the aftermath of a scandal). But the end game must remain clear: the path to 270 votes in the Electoral College. Many analysts are scouring the little available data which exists on early voting results, hoping to use that data to prognosticate the outcome of the election. With some exception, it is a fool’s errand. Hillary Clinton (per CNN) has fallen below the needed 270 electoral votes, uncertainty has implied equity market volatility near record levels when compared to actual, realized volatility. Hedge funds and asset managers globally are paying UP for protection. Some recent polls show Donald Trump surging against Clinton with just days left to Election Day (Tuesday, November 8th). 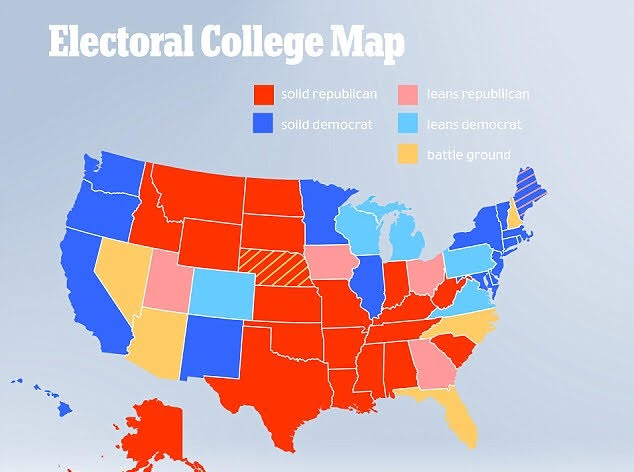 But the election is not decided by the popular vote, but by votes in the Electoral College, a system which apportions 537 votes among the states—or by the U.S. House of Representatives in the case of a tie or a situation where no candidate receives the minimum requires 270 votes in the Electoral College. While Hillary Clinton is favored to win the Presidency, a very plausible scenario exists where she does not receive the minimum 270 votes and the election is decided by the Republican House of Representatives. Thomas Jefferson was elected this way. So was John Quincy Adams. The tumult would be a fitting capstone to this tumultuous election cycle. The House of Representatives last elected the President in 1824—192 years ago. But rare events do happen: the Chicago Cubs won the World Series this season after a 108-year shutout. Why beware early voting analysis? Early voting statistics do not divulge for whom someone voted. They divulge how many people have voted and in some states, their registered party affiliation, gender or ethnicity. Party affiliation can be a proxy for whom someone voted. But if one believes that many blue collar Democrats may cross over for Trump and that Trump may lose many Republican women or that more people will vote for a third party candidate than in recent cycles, then early voting statistics are especially opaque this year. Further, even in past cycles, early voting results do not demonstrate a strong correlation with final election outcomes.